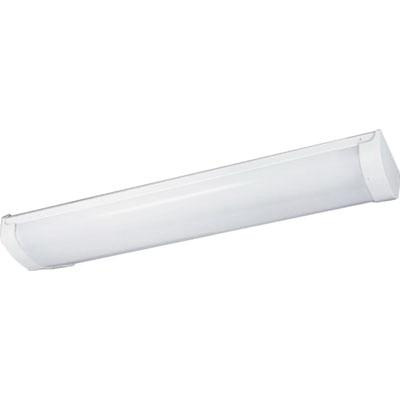 Progress Lighting Linear Fluorescent Bath Collection 2-Light slim line wrap modular linear fluorescent light in white baked enamel finish, features high-strength steel construction. Extruded frosted acrylic lens shade brings elegance to home. This contemporary/modern style light uses two 17-Watt F17T8 linear fluorescent lamps. Ceramic lamp socket lamp with 120-Volt NPF electronic ballast has voltage rating of 120-Volts. It measures 26-3/4-Inch x 6-1/4-Inch x 2-1/2-Inch. Ceiling mountable light is ideal for utility lighting and/or bathroom lighting. Light is UL/cUL listed and Energy Star qualified.